Prizewinner at the XV International Tchaikovsky Competition, V Paulo International Cello Competition and ICMA 2016 “Young Artist of the Year”, Pablo Ferrández announces himself as a musician of stature. His emotional intensity and personality on stage have wowed audiences around the globe. 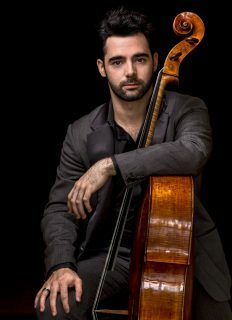 Praised by his authenticity and hailed by the critics as “one of the top cellists” (Rémy Louis, Diapason Magazine), the 26-year-old Pablo Ferrández continues building a brilliant career through collaborations with international renowned artists and world leading orchestras. Recent highlights include the performances of Brahms’ Double Concerto alongside Anne-Sophie Mutter in Madrid and Oxford, the debut with the Bamberg Symphony under C. Eschenbach within the Orpheum Foundation Program, and appearances with London Philharmonic, Israel Philharmonic, Vienna Symphony, Konzerthaus Berlin, Rundfunk-Sinfonieorchester Berlin, Maggio Musicale Fiorentino, St. Petersburg Philharmonic, Royal Liverpool Philharmonic, BBC Philharmonic, Orchestra Sinfonica Nazionale RAI, KBS Symphony, WASO, Spanish National Symphony, Barcelona Symphony, and at the renowned festivals, such as Verbier, Dresden, Folle Journée, Grant Park, Rostropovich, Rheingau, JCMF and Trans-Siberian Arts Festival. Ferrández regularly performs under the batons of Christoph Eschenbach, Zubin Mehta, Valery Gergiev, Yuri Temirkanov, Vladimir Jurowski, Thomas Sondegard, Vassily Petrenko, Gabor Takacs, David Afkham, Robert Trevino, Alpesh Chauhan, Joshua Weilerstein, Andris Poga, Juanjo Mena, Carlos Miguel Prieto, Rossen Milanov and Aziz Shokhakimov among others. The 18/19 season brings appearances with Rotterdam Philharmonic, Mariinsky Orchestra, St. Petersburg Philharmonic, Orchestre de la Suisse Romande, Acadmy of St. Martin in the Fields, BBC Scottish Symphony, Hamburg Symphony, Gurzenich Orchester, Antwerp Symphony, Montecarlo Philharmonic, Orquestra Filarmonica Arturo Toscanini, Warsaw Philharmonic, Szcecin Philharmonic, Tchaikovsky Symphony, Bilkent Symphony, Orquesta Sinfonica de Euskadi, Orquesta de Valencia, and Orquesta de les Illes Balears. As a recitalist and chamber musician, he will perform at the Musikverein, Wigmore Hall, Boulez Saal, Dortmund Konzertnaus, Moscow Phiharmonic and Bologna Opera, collaborating with such artists as Vadim Repin, Nikolay Lugansky, Maxim Rysanov, Beatrice Rana, Denis Kozhukhin, Ray Chen, Alice Sarah Ott, Elena Bashkirova, Michael Barenboim and Gerard Caussé. He has also recently performed with Martha Argerich, Gidon Kremer, Joshua Bell or Yuja Wang, among others. A captivating performer with a compelling technique, he is described as “an inspirational and expressive soloist who always places his skills at the service of the composer.” “Personal vanity is alien to Ferrández” (Rheingau Festival Award Jury). Pablo Ferrández recorded his first CD, featuring Dvorak and Schumann cello concertos, with the Stuttgart Philharmonic Orchestra conducted by Radoslaw Szulc, which was received with great acclaim: “Pablo Ferrández is a fine performer, with a warm tone and an impulsive, if refined, lyricism that makes him a natural interpreter for Schumann's concerto, with its melancholic elegance and flashes of mercurial wit.” (Tim Ashley, The Guardian), “It is in Dvorak that Ferrández announces himself as a cellist of stature” “(he) manages to play with huge emotion while still keeping his interpretation light and free from overindulgence” (Janet Banks, The Strad). Born in Madrid in 1991, in a family of musicians, Pablo Ferrández joined the prestigious Escuela Superior de Música Reina Sofía when he was 13 to study with Natalia Shakhovskaya. After that he completed his studies at the Kronberg Academy with Frans Helmerson.